A lot of people come to us with their canvas in great shape but their windows are on their last leg. When it comes to cases like these, we do window replacements. Today that’s what we are doing, forward window replacements. These windows are starting to discolor, become foggy which can prevent visibility. They are also starting to crack which will cause water leakage. A cost effective way to help fix this issue is to replace the glass. We start off by measuring the windows with our 3d measuring device then we go to the computer and have the actual window size that’s needed to replace the glass. While one of us does the design work, we have another person prepping the windows. 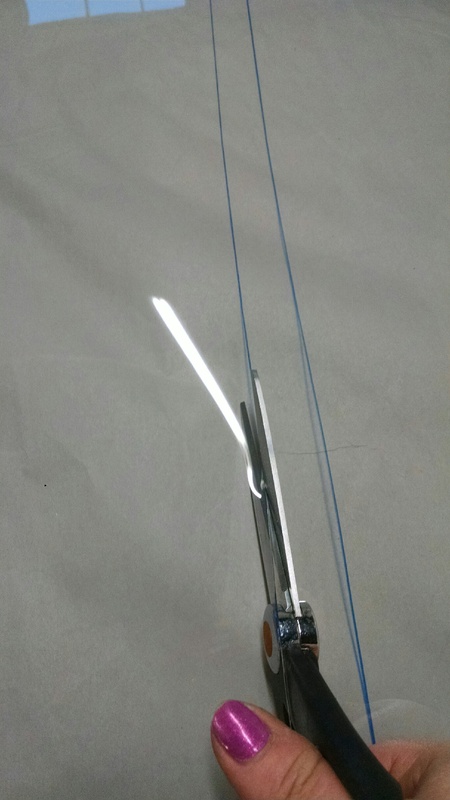 We start off by cutting as close as we can without damaging the canvas with a knife to give us room to start using scissors to cut the old glass out of the windows. After all the old glass is removed we cut out the new glass for the windows. For these window replacements, we used Strataglass in Light Smoke, which has a slight tint to it. After those are all cut out, we start replacing the new glass into the old canvas. 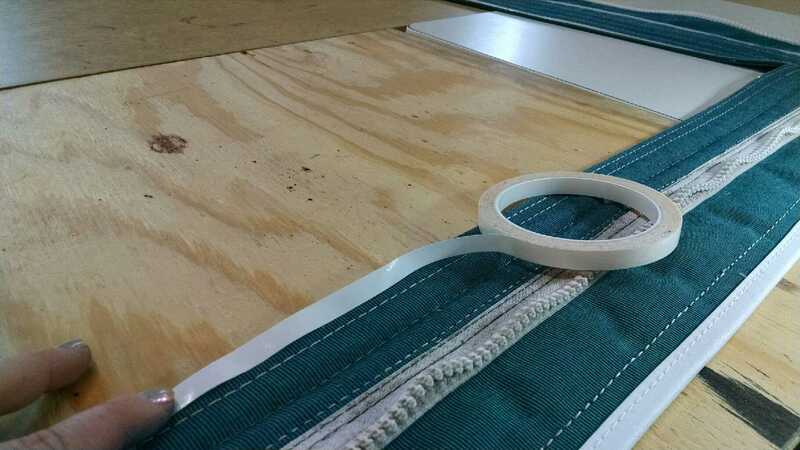 Using seamstick to make sure that all of our needle holes can become waterproofed, we line the whole outside edge of where we will be sewing along the window. We don’t want your new windows to leak any water! 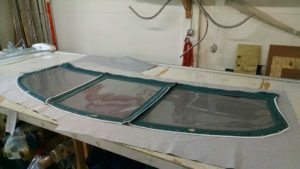 After the seamstick is applied to the canvas, we take the new windows and line them up correctly, and then sew them all down. After we are all done, here’s how they look. Nice and flat, and brand new! The old cracked discolored glass is gone and your windows look brand new! When summer comes around your windows will look updated without replacing your whole canvas! 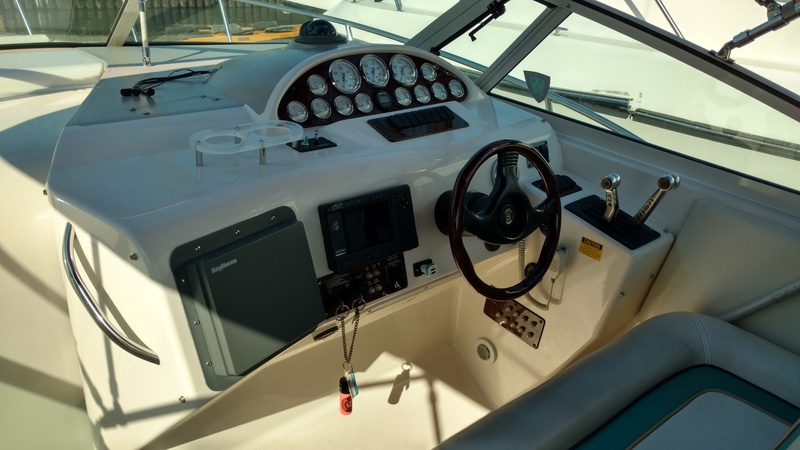 For this Sea Ray, we did a custom cockpit cover with custom boots for their framing. Here at Chicago Marine Canvas, we only do custom work. That means no two covers are a like. 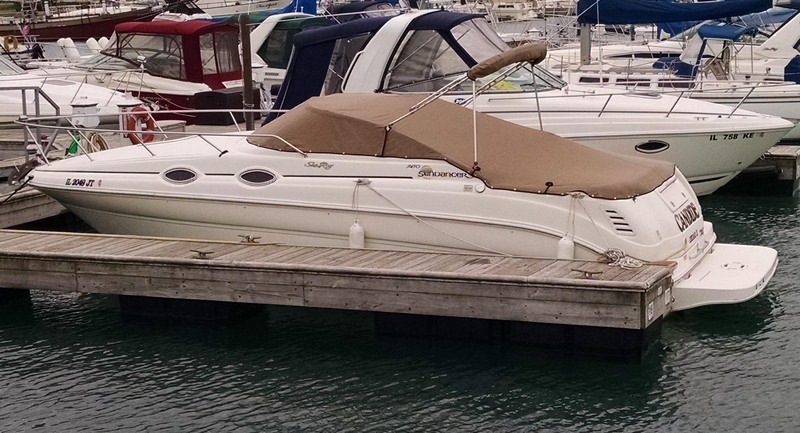 We begin every job by physically going out to your boat to take measurements with our 3D measuring device. Our measuring device is one of the many tools that we have here in our shop that is cost-effective and labor saving. After we gather all the right numbers, we head back to our shop to begin the design process. We do all of our design work on the computer using CAD (Computer-Aided Design) Software. This helps save us time and you money. Here we can quickly design your cover, and see it in 3D before we even sew it all together. Once we make sure that all of your needs are met and that the design is top notch, we send it over to our plotter. Our plotter is another one of our fun tools that we use to save us time and you money. It can quickly draw out the pattern for your new cover in a matter of minutes, without any errors. After it’s all drawn out, our seamstress cuts out all the pieces and begins to sew it all together. For this cover we used Sunbrella fabric in Heather Beige! 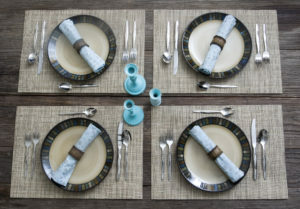 Sunbrella fabric is one of our favorite canvas’ to use here in our shop! It comes with a 10 year warranty and is fade resistant! To sew everything together we used GORE Tenara thread. GORE tenara is a great thread to use for outdoor applications because it is UV resistant, weather resistant, and chemical resistant. 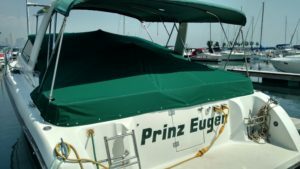 It comes with a lifetime guarantee, which means no more restitching once your cover has been out in the sun for a few years! 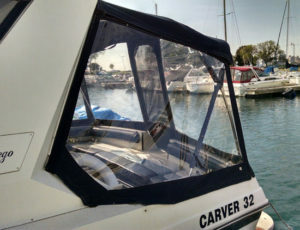 Canvas still looking great but your windows are cracking or are starting to become discolored? An easy cost effective way to fix that issue is window replacements. 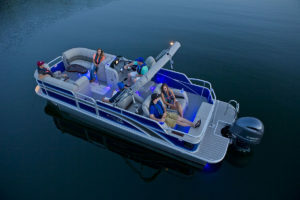 Our process is a little different then other boat shops. Over time your canvas can become stretched out or even shrink after its been on your boat for a while. To help ensure that your windows will fit we start off by taking your old windows and removing the old glass from them. 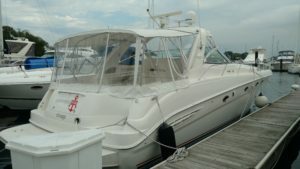 Then we head out to your boat, zip the windows back onto the bimini and snap them down to the boat. We then take our 3D measuring device and take real measurements of the windows, so we have a guide as to where the new windows need to be sewn, so they look great and fit just right when we are all done! We can also help you pick out your new window material. Maybe you want Strataglass or Eisenglass. 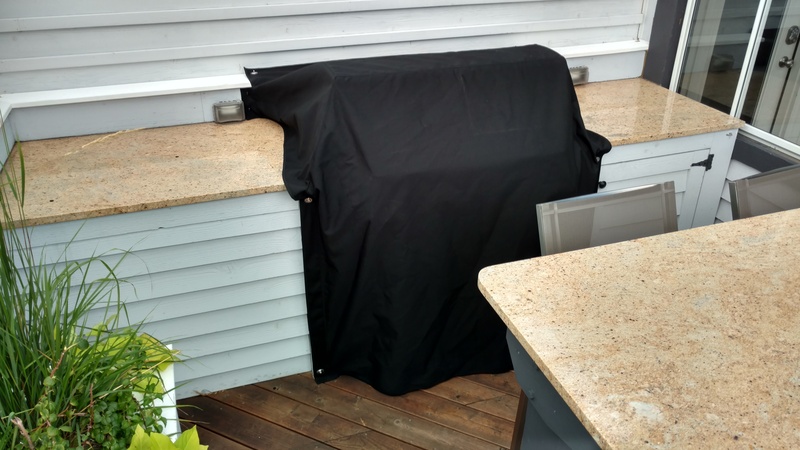 We created a custom grill slip cover for an outdoor grill/eating area. We start off all of our projects by physically going out to your home. Once we arrive we get out our 3D measuring device. With this tool, we can quickly take measurements of your outdoor area, saving us time and you money at the end of the day. After we get all the measurements we need, we head back to our shop and start the design process. We do all of our design work on the computer using CAD (Computer-Aided Design) Software. It makes things quicker for us and allows us to see the design in 3D before we draw out all the pieces. After we make sure our design is perfect and all of your needs are met, we send everything over to our plotter. This draws out our design perfectly and quickly. 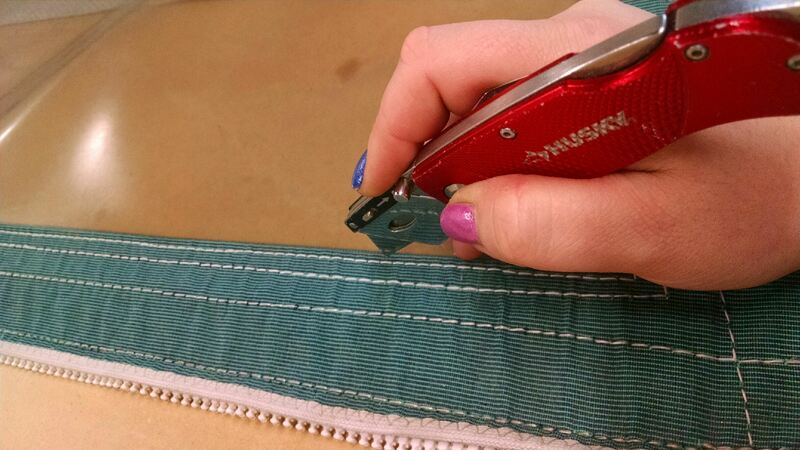 Once it’s all drawn out, our seamstress cuts out all the pieces, and begins to sew it all together. 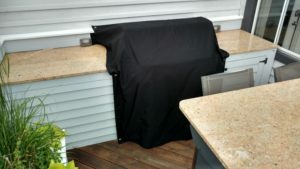 For this grill slip cover we used Aqualon fabric. 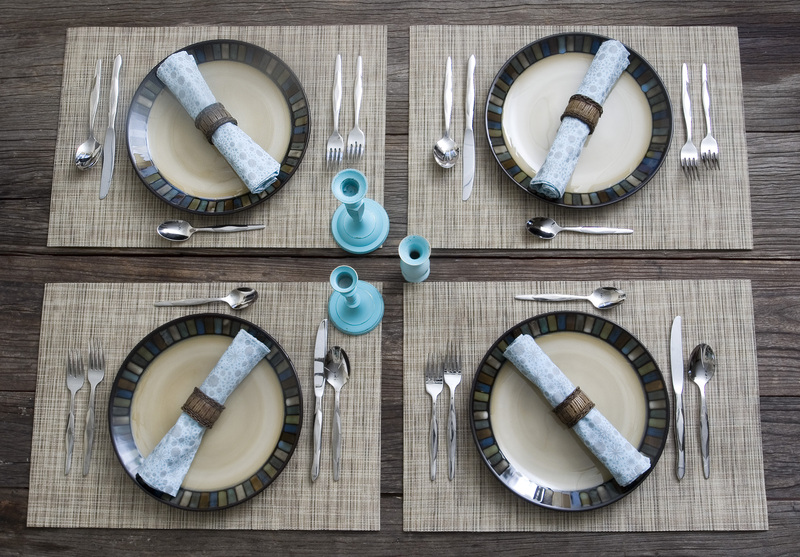 Aqualon is vinyl-coated polyester with a water repellant on it. It is mold and mildew resistant. It wont crack or harden. 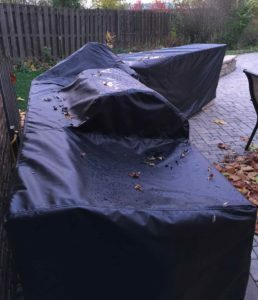 Its great for outdoor covers because of its resistance to weathering! We used Lenzip zippers on this cover. Lenzip zippers have a lifetime guarantee! 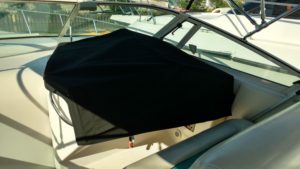 The zippers allow easy access to parts of the grill and allow the cover to be easily removed and put on the whole area! Need a custom cover for your navigation console? Were the people to come to. 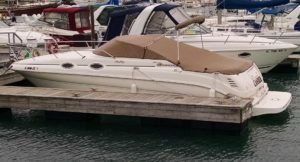 Using our 3D measuring device, we can assure to fit all your boats needs. 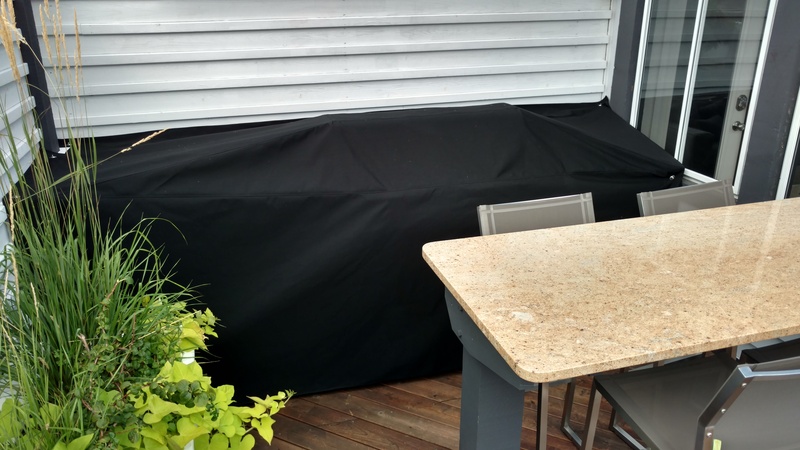 We created this custom cover out of Black Sunbrella fabric. Using DOT snaps, it snaps right onto the console itself making sure the wind wont take it away, and your navigation area will stay dry! Made in the U.S.A. Infinity Fabrics is the green way to accommodate your boating needs. Made with 100% recyclable materials, this flooring is U.V. resistant and has antimicrobial technology which prevents bacterial growth. This flooring is pet friendly, and is unaffected by sea gull and spider deification! It also is unaffected by gasoline, motor oil, and grease. Most flooring or carpeting use urethane backing. If you have this kind of flooring you will notice that once your flooring gets wet, it stays wet for a long period of time which will encourage mold and mildew growth among the fibers. 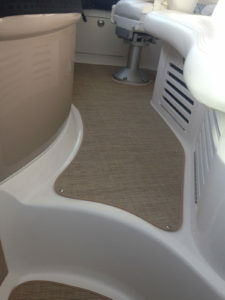 Urethane backing on flooring also discolors, cracks and is shreds leaving a mess all over your boat. 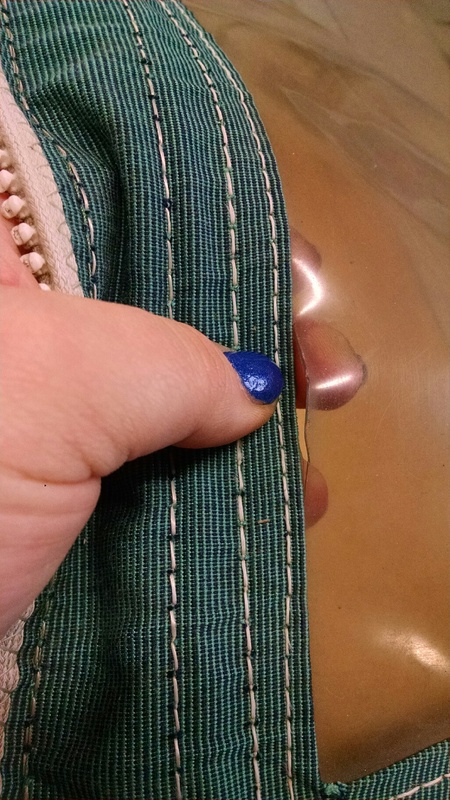 Infinity Fabrics uses vinyl backing. Since the front of the flooring is also vinyl this means that both the front side and back side of Infinity Luxury Woven Vinyl is recyclable. 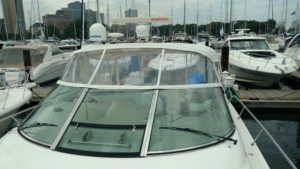 The vinyl is anti-microbial and anti-bacterial, so mold and mildew cannot grow here! Infinity Luxury Woven Vinyl dries quickly and can never get soaked by any liquid. 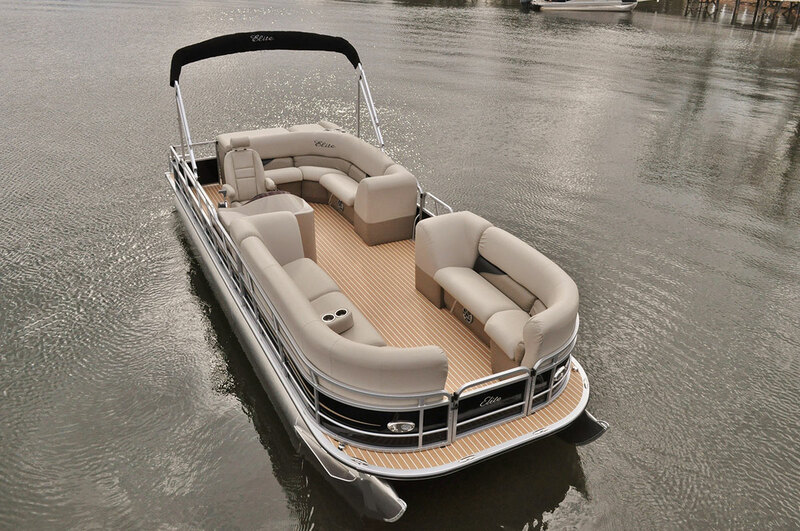 According to Infinity fabrics, if their flooring is submerged in water, it will actually float, not sink like typical carpeting. The best way to keep Infinity Luxury Woven Vinyl looking spiffy is by hosing it down on a weekly basis with clean water. This helps prevent dirt build up from becoming stuck in between the complex weave structures that make your flooring look great! -Brush off loose dirt on you flooring with a broom. -Mix a solution of clean water and mild soap (such as dishwashing liquid or a house hold cleaner), apply a small amount to Infinity Luxury Woven Vinyl and use a small bristle brush to clean. After that, rinse thoroughly until all the soap residue is gone! Allow it to air dry. -Mix a solution of 1 cup bleach and 1/4 cup mild soap per gallon of clean water. Apply small amount of the bleach/soap mixture. Blot the stain with a sponge or clean towel. Rinse thoroughly until all the soap residue is gone! Allow it to air dry! 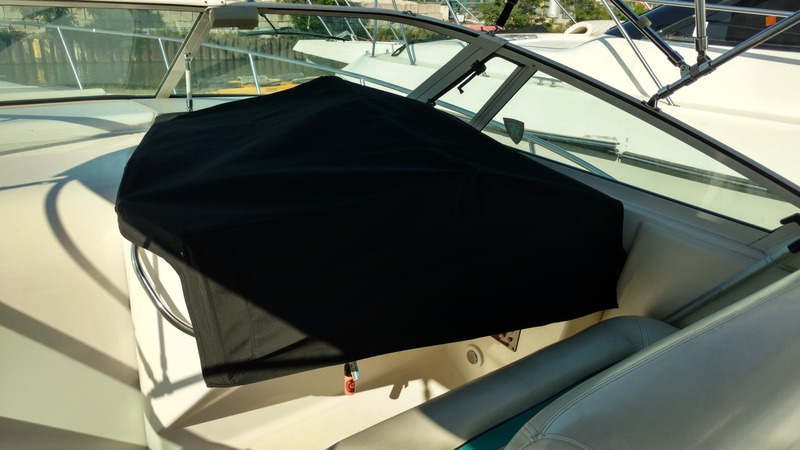 -Protect the area around your Infinity Luxury Woven Vinyl if using the bleach/soap mixture. 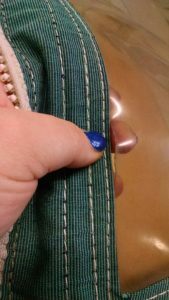 Other fabrics that are not made by Infinity Fabrics maybe have an adverse reaction. -If you want to get your flooring professionally cleaned, make sure you ask if they have any experience with Infinity Luxury Woven Vinyl. -Always rinse Infinity Luxury Woven Vinyl thoroughly to completely remove any soap or bleach you may have put onto the flooring. -Be aware of the environment, bleach can have harmful effects on the natural environment around you. -Infinity Luxury Woven Vinyl should only be air dried! 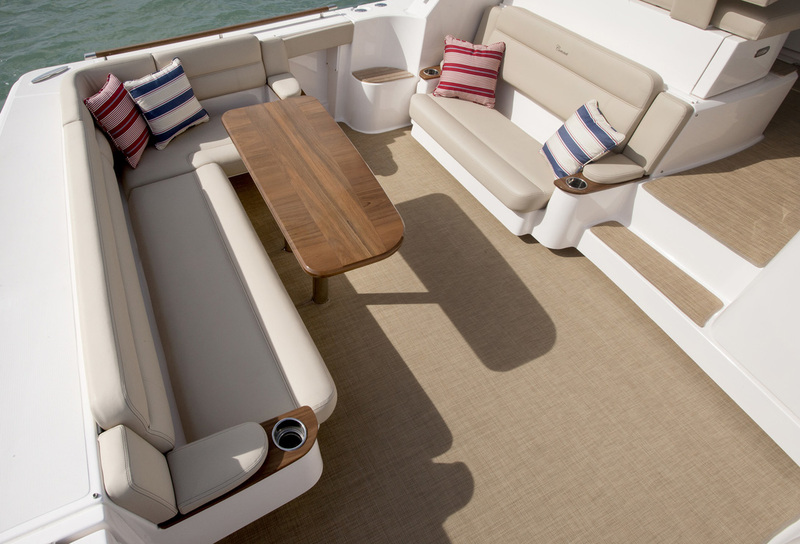 All Infinity Luxury Woven Vinyl could stay on your boat all winter long. It can stay on the flooring flat, how it is installed. It also can be rolled up, with the patterned side facing out, cushion side in! Ask about your extra flooring scraps! 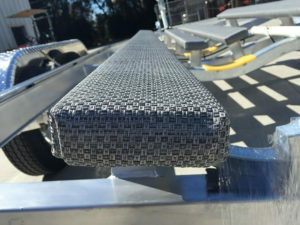 It can be made into floor mats, door mats, place matts, swim platform matts, even a matt for your dock! Infinity Luxury Woven Vinyl has a ten year limited warranty!!! Interested in getting rid of your moldy carpeting forever?! Check out Infinity Luxury Woven Vinyls different weave patterns and then give us a call! Check out their other products such as their supreme bimini canvas fabric, their superior upholstery vinyl, or check out their other uses for their luxury woven vinyl flooring. For more information visit their website or read their product guide. 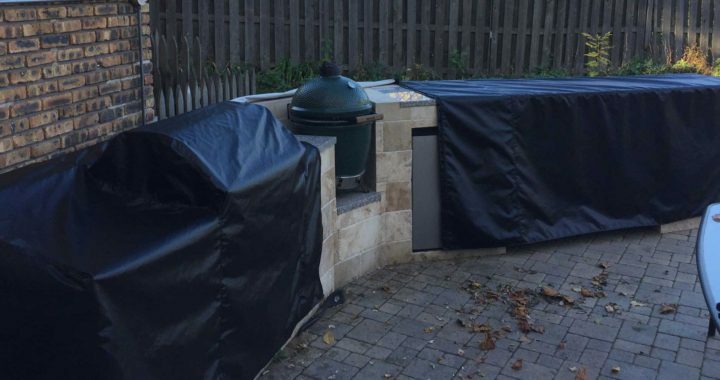 Here in Chicago, a lot of people have an outdoor kitchen area. 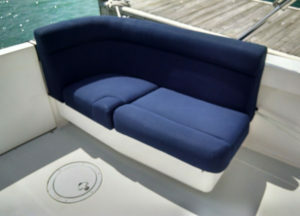 Most of these areas are custom built meaning they need a custom cover, from someone like us! All of the work we do here at Chicago Marine Canvas is custom made. 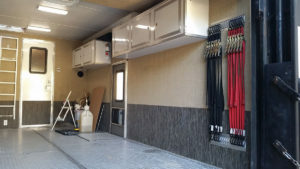 So we start off all of our projects by first listening to our customers needs, and making sure we can cover all of them before we start a job. 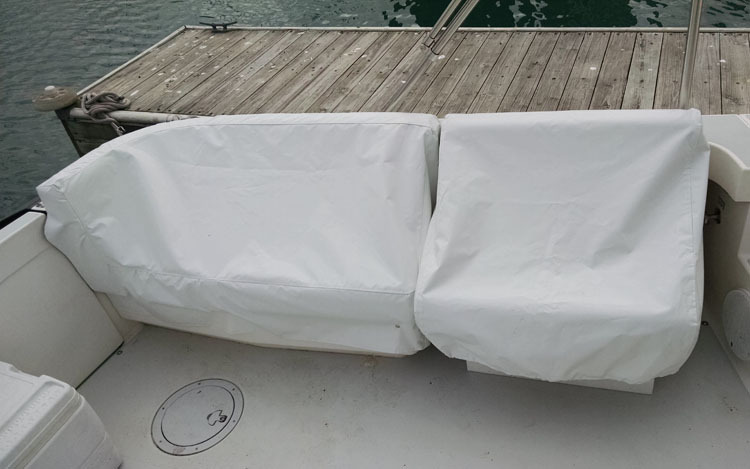 Customers often want two different types of covers from us. A summer one, for easy access and then a winter one that covers the whole area. The first step to our process is to go out to your house and gather measurements from your outdoor kitchen area. We do this with our 3D measuring device. It is one of the many labor-saving, cost effective tools we use here at our shop. 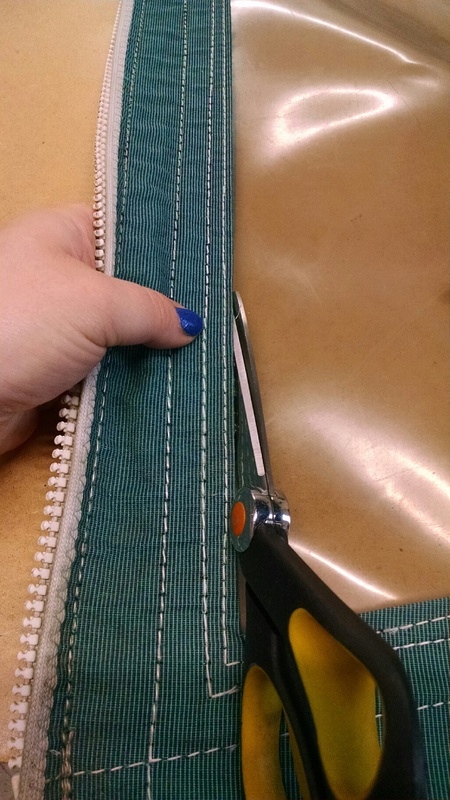 After we get all the measurements, we head back to our shop where our designer gets to work. We do all of our design work using CAD (Computer-Aided-Design) Software. This program allows us to see the design in 3D prior to us making up your custom cover. This way we can make sure all of your wants and needs are met! Once we finish up the design we send everything over to our plotter and let everything get drawn out quickly and perfectly. Then we hand everything over to our seamstress who cuts everything out and starts sewing everything together. For these covers we used Sunbrella fabric in Black. Sunbrella is fade resistant and comes with a 10 year warranty. We used GORE Tenara Thread in black. GORE Tenara Thread has a lifetime guarantee. 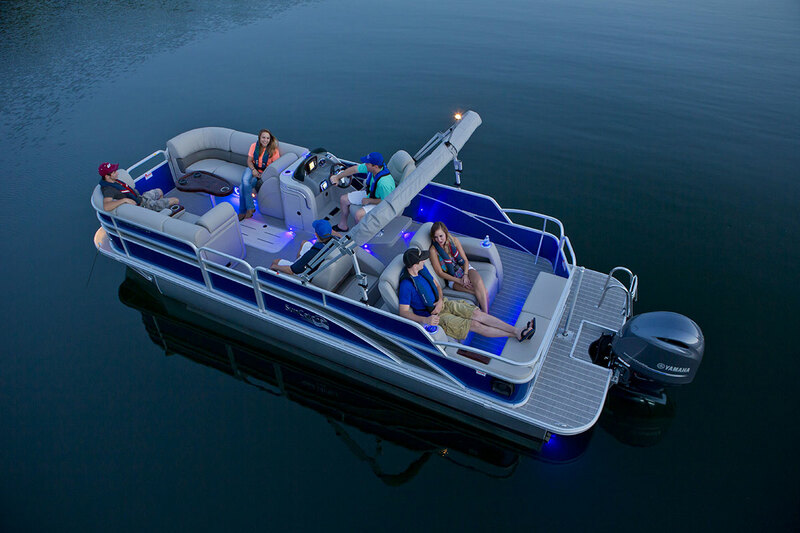 It resists UV sunlight, chemicals, saltwater, extreme weather, and acid rain. It is a great thread to use on covers that will be outdoors!